On March 15, at approximately 9:30 a.m., CPSO deputies responded to a report of a single vehicle accident at the intersection of Joe Miller Road and West Armand Street in Moss Bluff. Upon arrival, deputies discovered the truck appeared to have run off the road; striking a culvert, stop sign, and then utility pole which caused the truck to flip over. The driver, Dustin B. Monceaux, 45, 1200 Joe Miller Road, Moss Bluff, was trapped inside and had to be extricated from the truck. When deputies spoke with Monceaux they detected a strong odor of alcohol emitting from his breath. Monceaux stated that he had drank a half pint of liquor. Deputies also located an open bottle of liquid inside the cab of the truck. 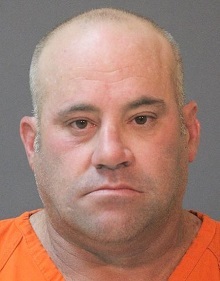 After Monceaux, who has 3 prior DWIs, performed poorly on a standard field sobriety test, he was arrested and transferred to the Calcasieu Parish Sheriff’s Office, where a breath intoxilyzer test revealed he was over the legal limit. He was booked into the Calcasieu Correctional Center and charged with DWI 4th; and careless operation of a vehicle. Judge Robert Wyatt set his bond at $51,500. CPSO Deputy Sr. Cpl. Sam Smith is the arresting deputy on this case. I'm pretty sure this is his 6th or 7th DWI not his 4th.